Of all the template holes and design concepts in the palette of Charles Blair Macdonald, Seth Raynor and Charles Banks, none is more misunderstood than the Cape Hole. It was Macdonald who most likely gave the design its name, first popularizing it with the 14th hole at the National Golf Links of America, which opened in 1909. 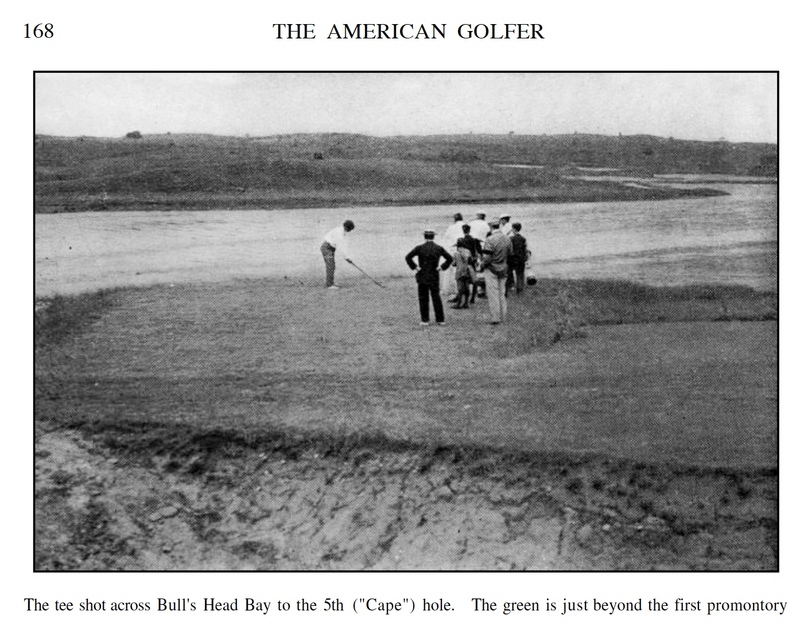 A view of the National Golf Links America Cape Hole tee shot from the August 1910 issue of American Golfer. When the course opened, the Cape was the fifth hole. Here is how the idea is described by Macdonald and H.J. Whigham in the August 1914 issue of Golf Illustrated. The original green was moved to its current location, making the hole longer, when a road was built within a few years of NGLA opening. The green no longer extends into the ocean but the sea has been replaced by sand. In Macdonald’s mind the green is the “cape,” and the designation has absolutely nothing to do with the tee shot as so many golfers, golf writers, club golf professionals, TV announcers and the creators of yardage books think. 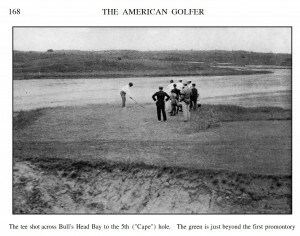 A bite-off tee shot over water or sand is not part of the Cape concept, at least not as Macdonald, Whigham, Seth Raynor and Charles Banks thought of it. The idea that the tee shot is what defines the cape concept is flawed for another simple reason, a cape has water on three sides, think of Cape Cod or the Cape of Rodon in Albania, it’s not merely a strip of land bordered by water on one side. Once the true meaning of the “cape” concept was lost, the incorrect description proliferated. What Macdonald’s description indicates is that almost any green that is open in front but on which all other sides fall off into trouble could be considered a Cape. Writing in the Aug. 28, 1925 issue of The Yale Alumni Weekly, Banks states just that point, using two holes at Yale as examples. “The green is natural on the ground and is close to the cape type in general setting,” he wrote. The reason they are not true Capes is that the two greens have areas other than the front with which an approach shot can safely miss the target. On the second, it is right and long of the putting surface, and on the eighth it is long. On both, however, missing in the wrong locations results in severe punishment in the way of bunkers set well below the putting surface, some as much as 20+plus feet. Another popular example of the design is found at the Mid Ocean Club, Macdonald’s design in Bermuda. Here the tee shot requires a carry over water. The green extends into Mangrove Lake and is now bordered on three sides by dense vegitation. 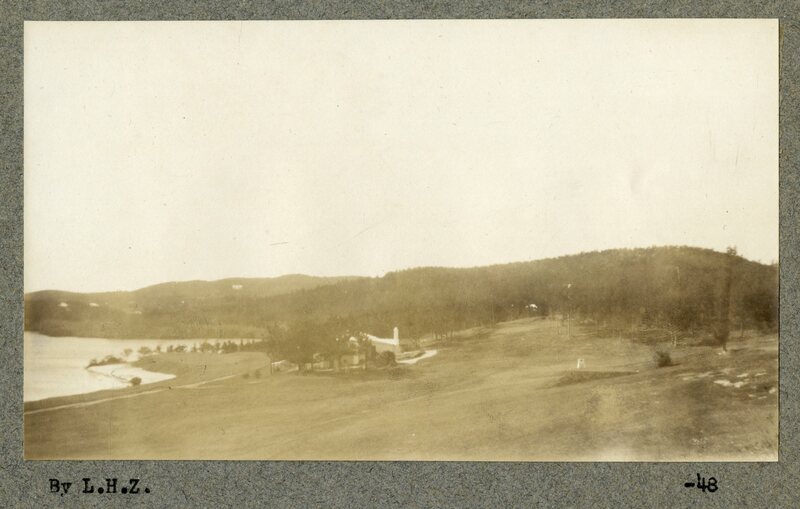 Originally, as seen in a blurry photo found in the archives of the Frederick Law Olmstead National Historic Site, the left side of the green was up against a massive sand hazard that ran right to the water, as a bunker did on the original Cape at NGLA. length. The original NGLA version was short, even for 1900, at less than 300 yards. One of the exceptions to the rule, at least on the scorecard, is the 14th at Fishers Island that plays 425 yards from the back tee, but the actual route can be shorter for those who challenge the water on the left. A daring 220-yard tee shot leaves 165 yards to the middle of the putting surface. Playing downwind in the summer and with the non-irrigated fairways firm, a common strategy is to hit a 250-yard tee ball to the middle of the fairway, near it’s end, staying well away from the water and leaving an approach of approximately 160 yards. The Cape Hole at Fishers Island Club. Successfully challenging the water on the left significantly reduces the length of the approach shot. For the player bailing to the right on the 60-yard-wide fairway, the play to the putting surface is in the neighborhood of 200 yards. The green, which leans mildly back to front, is wide open in front but is ringed the rest of the way in shallow bunkers. Raynor created the entire hole on what was wetland and shoreline, pumping sand from the ocean bottom, the way he first did at the Lido Golf Club on Long Island, N.Y..
Not surprisingly, the green size and style of the Cape can vary. At Yeamans Hall, for instance, a pronounced depression similar to the “thumbprint” on Short Hole greens is found on the smallish putting surface. Golfers who have played designs of Macdonald-Raynor-Macdonald will have their opinions on which is the “best.” There can be, though, no discussion about the most inaccurate description of Cape Hole. 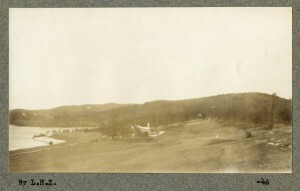 It came in a local publication chronicling the opening of Old Marsh Country Club in Wells, Maine, a Brian Silva design.